“Just” Is All It Takes. 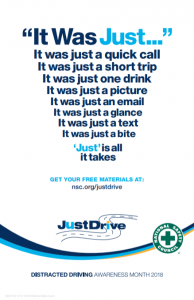 Put Your Phone Down And “Just” Drive. Distracted driving doesn’t mean just texting, it includes anything that takes your eyes and attention off the road including eating, grooming, reading, taking pictures/videos, talking on the phone and checking email or social media apps. All of these fall under three main types of distractions; visual, manual and cognitive. A visual distraction draws the driver’s eyes off the road while a manual distraction causes the driver’s hands to leave the steering wheel. A cognitive diversion veers the driver’s attention from driving. All of these can endanger drivers and passengers alike! Thousands have died in vehicle crashes because drivers are distracted by cell phone conversations, emails, text messages and social media. Do not become a statistic. Here are some tips to keep your eyes on the road, your hands on the wheel and your mind on drive. If you’re going on a longer drive, schedule breaks to stop, park safely and respond to messages. Know where you’re going before you put your car in “drive”. Put your destination into your GPS so you not need to touch it while the car is moving.